All good things must come to an end; that's a truism. Luckily it also applies to the less than good. 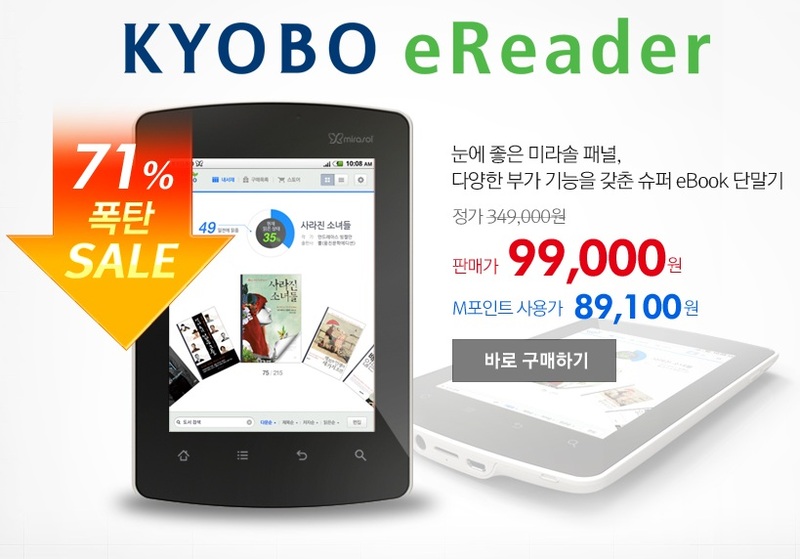 Kyobo Book Centre, South Korea's leading bookseller, has recently put their Mirasol eReader on sale at a drastic discount. I'm still waiting for confirmation from Kyobo or Qualcomm, but it looks to me like this ereader is on the way out. That's great; neither the software nor the screen tech were worth the original retail, which was more than $300 USD. The price posted above is 99,000 won, or about $87 USD. That's a considerable discount off the original 350,000 won, and it leaves little doubt that this ereader is headed for the scrapheap. Kyobo was the first company in the world to carry an ereader or tablet or tablet with a Mirasol screen, and they launched it in late November 2011. It generated a lot of attention at the time, but the excitement started dying off shortly after I posted my review. The bloom completely fell off the rose when all the tech blogs got a chance to see it at CES 2012. The screen frankly didn't live up to the previous several years of hype. The original design for this ereader came from inside Qualcomm, with the reading app and other customizations added by Kyobo. It's based around a 5.7" Mirasol screen. It runs a closed version of Android 2.3 Gingerbread on a 1GHz Snapdragon CPU. The screen, now that took a while to develop and given what I've heard about the limited sales I'm not sure that Qualcomm has broken even on it. The Mirasol screen tech was originally developed by a company called Iridigm, which Qualcomm bought in 2004. After 8 years of investment that likely has totaled a couple billion dollars, Qualcomm has little to show us beyond a paltry number of devices sold in a few small niche markets (South Korea, Taiwan, and China). Now, Qualcomm did show off a new 4.3" screen at SID Display Week last month, so there's hope that they can enter the smartphone market and recoup their costs. But there's no word yet on when that new screen will go into production. Goodereader is reporting confirmation from Kyobo; the line is discontinued. Yes, but they tend to make things up, including inventing improbable rumors. They also got a bunch of facts wrong with this story so I’m not sure if that detail can be relied upon. Edit: And now they’ve corrected their post with details I found first, only without crediting me as the source. I’m not surprised; they often don’t credit their sources. Thanks, Nate! Just ordered one for myself. Has any rooting community sprung up around it like with Nook? I’d like to know if any rooting has managed to speed up that slow POS. Even less than $100 is not worth it for something that’d make you rip out your eyebrows manually hair-by-hair due to its slowness! I would like to order one for myself. Can you please guide? I am from India and a regular on your blog. I need something to read color comics and ebooks in travelling without backlight. Thanks. 6) ONLY credit/debit cards supporting 3-D Secure technology (Verified by Visa or MasterCard Secure Code) are accepted. If you or anybody else have problems with ordering, you are welcome to ask me questions via Skype or Twitter, nickname sobolz in both messengers. “rooting won’t improve performance in itself.” PASS. I also would like to order one. Do you guys know if they will ship to the US when following the above procedures? Thanks. Thanks for the guidance. I could not complete the transaction through kyobo book store. finally, I bought one through http://www.collectKorea.com. It will be delivered tomorrow. Can you help me converting the ereader to english interface and installing the google play store. I need some good PDF/epub/cbr/canned images directory reading apps. I am not a tech expert like you people. You will find all the answers there. Man , does it allow you to install any app or just some of em ..? Vikaram, I tried looking for it in the link you’ve posted but coud’nt actually find it there,how did you get it man and how much did you pay for it (rupees) also does it let you install any android app upon it ? I too am very much interested in the mirasol display.